In his book, Debt: The First 5,000 Years, David Graeber quotes an article by a certain Rosemary Harris, from 1972, on “The History of Trade at Ikom, Eastern Nigeria”, published in the review Africa: journal of the International African Institute [vol. 42 (2) : 122-139]. Given that Rosemary Arnold was working on Dahomey (Benin) and that Nigeria is bordering, could it be the same person, but under his name of married woman? After his doctorate with Karl Polanyi at Columbia and his collaboration with the Council for Research in the Social Sciences (1954-1958), I cannot find his trace, neither in the archives nor on the Internet. On the latter, unfortunately, I only find information on a namesake, actress who played in Spider-Man. Header photo: “Avossê novice dancing/ Avossê -noviisi tanssimassa”  par Helinä Rautavaaran museo. 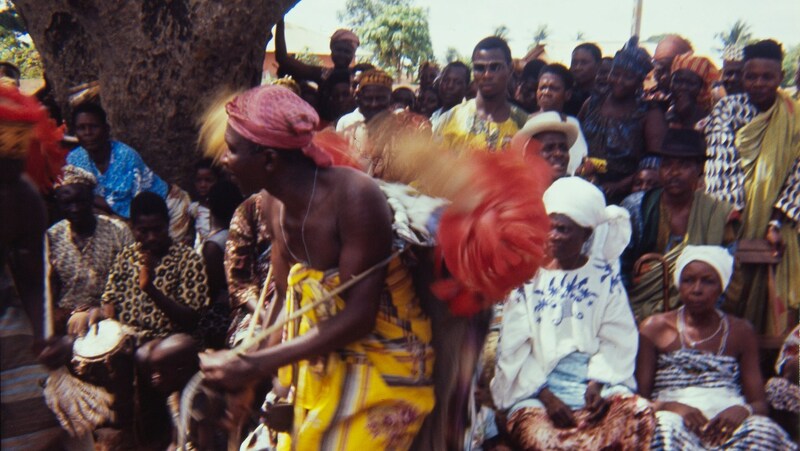 A novice dances in front of musicians playing tam-tam drums. The man is wearing a ritual dance outfit Kpon.